Today we will be covering the new companion system. Many things have changed with the system in Undermountain so I will do my best to cover all of it here. Active companion slots are things of the past. Currently, these slots primarily serve as containers for ACBs and as such they have been changed to do just that. As a part of this change, ACBs have been rebranded and made into a separate piece similar to mount powers. This new piece is referred to as a player bonus. Player bonuses can be equipped in player bonus slots and are limited by type. The types are offense, defense, and utility and, as you can guess, they give bonuses that are similar to the type. Some player bonuses can go in multiple slots. The power of player bonuses are based on the quality of the companion they came with. So in order to increase the base effectiveness of a power that companion must be upgraded. The companion does not have to be summoned, just its quality increased. Each slot offers a filtered list of available player bonuses. An additional piece of companions are slottable powers known as pet enhancements. 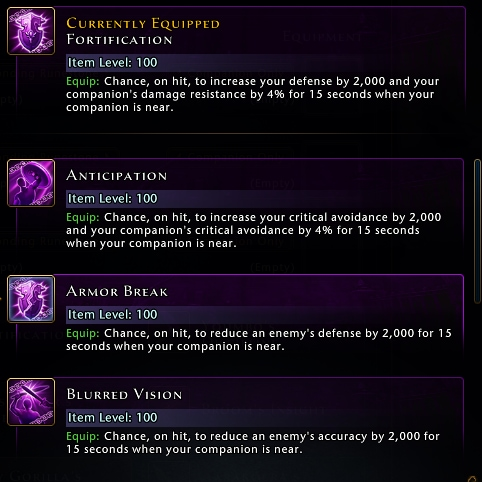 These are buffs or debuffs that are triggered when the player uses a power. Of course, in order for this to happen there has to be a companion summoned and in range. While player bonuses are unique for each companion, the pool of player enhancements is much smaller. 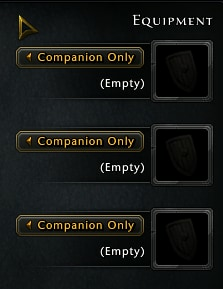 So multiple companions can come with the same pet enhancement. The equipment that companions wear are now universal. Gone are the days of having to equip each companion with their specific equipment requirements. 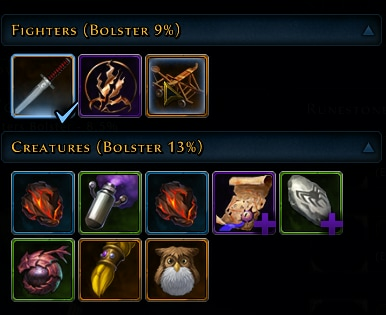 Now companion equipment slots allow the player to equip any piece of companion equipment in them. Notice how I said companion equipment; companions can no longer equip player equipment, they are now only interested in companion-only equipment. On top of this change to equipment, the slots have been globalized. So no matter what companion you decide to switch to, the equipment will apply to the summoned companion. Runestone slots have also been changed. Since Bonding runestones have become such an integral part of the game, we converted the runestone slots to Bonding runestone slots. These slots have also been made universal so you only need 3 to benefit from any summoned companion. Note that I am only talking about Bonding runestones. Well, that is because Eldritch runestones are a thing of the past… sort of. Bonding runestones and Eldritch runestones had a talk and decided that Bonding runestones would start to work like Eldritch as long as they could still be called Bonding because Bonding is a much cooler name. This change to Bonding means that both combat and augment pets benefit from the runestones. 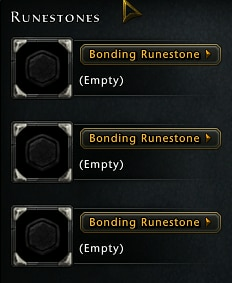 For those of you with Eldritch stones, we are implementing a trade in so they can be converted into Bonding runestones. So I bet you are wondering about those other runestones, well with the limiting of the Bonding runestone slots the other runestones have been set free to live in the slots of all companion equipment. That’s right, companion equipment is the new home for runestones. Over the years some of you have collected many companions. Unfortunately they have had to sit and collect dust unable to provide any support. Thankfully this has changed with the new bolstering system. Now upgrading and levelling up multiple companions in storage benefits any summoned companion in the form of a bolster bonus. Bolstering increases the combat effectiveness of the summoned companion or the special ratings of an augment pet. The more of a certain type of a companion you have, at higher quality, the larger the bonus. A companion type is what determines where the bolster bonus comes from. There are 5 types, or categories, that companions now fit in. These categories are fighters, creatures, invokers, mystical, and beasts. Adding companions from each group will increase the bolster bonus. 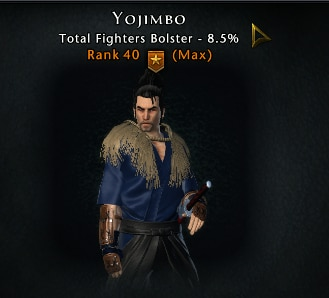 Maximum bolster bonus can be reached if you have at least 5 companions of the highest quality within a category. Which 5 does not matter, the bonus is derived from the 5 best quality companions you have. Those are the highlights of the companion changes. Along with this update will come changes to how companions scale, their survivability, and from where they get their damage values. The hope is that the player will have more freedom to use different companions without feeling like they are making a bad choice just because they want to use a different companion. Decoupling the direct link to player power and companion combat effectiveness means you can freely explore other options. 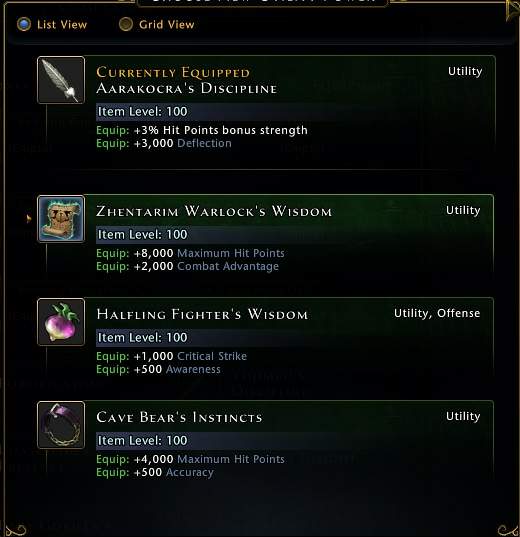 If you are curious to find out more please log on to our preview server and check Neverwinter: Undermountain out. IT’S THE BEST!